In the classic 1949 MGM musical On the Town, some of the main members of the ensemble sing a spirited homage to the notion of playing all night long, with such double-entendre-laced lyrics as, "There's a lot of nice things to do in the dark" and "We're riding on a rocket, we're going to really sock it!" The town was New York, but the idea of going on the town could fit any city where fun could be found at any time -- and in myriad ways. On the Town: Photographs of Timeless Celebrations and Merriment, an exhibit of roughly 55 photos, gives you the famous and the forgotten celebrating life, love, lust, and liquor. 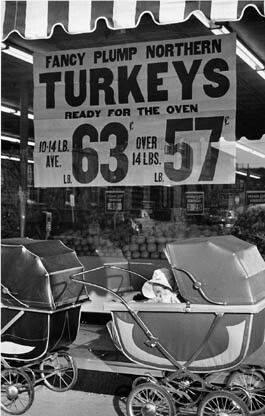 It opens on Friday, Nov. 27, at the Monroe Gallery of Photography. "After the year we've all been through, it's time to have a little fun," gallery co-owner Sidney Monroe explained of the decision to mount the show. "There's a lot of different definitions for 'on the town.' It can be as simple as going to a diner or café for a meal or as opulent as Frank Sinatra and Mia Farrow dressing up to go to Truman Capote's ball." Too bad the photo of Frank and Mia, a 1966 shot by Harry Benson, makes the pair look as if they're going on the warpath. Sinatra offers the hint of a weak smile to the cameraman, but his look suggests either that he's not happy being caught in a silly black mask or that he's missing Ava Gardner. Farrow is looking down, probably wishing she were on the set of Roman Polanski's creepy thriller Rosemary's Baby instead. Bob Gomel caught a lonely-looking Marilyn Monroe sitting at a dinner table, circa 1961. Balancing out her sorrow is another shot by Gomel of an aged Dr. Benjamin Spock, cigarette in mouth, shown cutting a rug in his (or somebody's) living room. But it is the non-celebrities who seem to be having the most fun on the town. 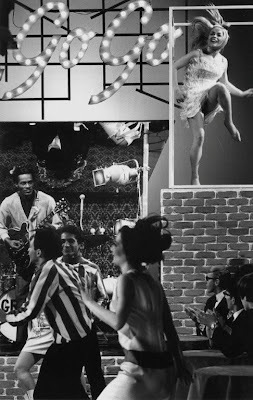 Gomel caught a peak moment at a party scene at Aspen's famed bar the Red Onion on a winter night in 1962. The bartender looks bemused as the mostly male crowd focuses on the antics of a group of sweater-clad ski bunnies who seem to have stumbled out of a Beach Party (or Ski Party, in this case) film to do an impromptu musical number. The venerable Red Onion closed in 2007, but is due to reopen sometime this year, based on recent newspaper reports. So, it may once again be a place to go on the town. Other hangouts featured in the show were so much a part of their time that they must have closed by now. 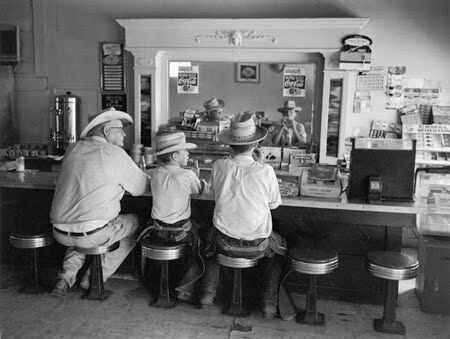 For instance, what's the status of Arnold's Café in Lovelady, Texas, where Guy Gillette photographed some diners contentedly sitting at the counter? "Arnold's burned down. 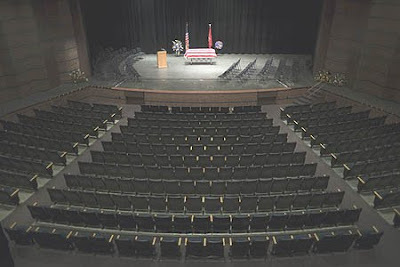 It's not there anymore," said his son Guy Gillette Jr., who lives in nearby Crockett, Texas. "The picture was taken in '56 and it was a great little place but no more. That's me in the picture -- my brother and I and our grand-father. I'm the older of the two brothers. What we're having there is just sodas." (A king-size Coca-Cola cost 6 cents then, according to a placard.) "But the food was good as I recall -- real café chicken-fried steak style stuff." In a follow-up message, Gillette said he talked to someone in the know who recalled the café burning sometime in the late 1960s. And what about the Dreamland Dance Hall in Turnbridge, Vermont? Verner Reed shot five dispirited-looking people sitting and standing outside it, as if they are waiting for its doors to open, hoping to catch someone passing by who can spare them a dime. The hall, built in 1920 by a pair of residents involved with the Turnbridge World's Fair (which began in 1867 and is still an annual event), was a popular meeting place until the 1980s, according to local historian Euclid Farnham. So what happened to the place? "I'll tell you what happened," Farnham said by phone. "Every so often we get tremendous snow years. And 25-some years ago we had 100 or 150 inches of snow; we had a mammoth blizzard and before anyone could get in there to shovel the roof off, the building collapsed under the weight of the snow. We were still using it as a dance hall even in the 1980s, but dances of that type had faded and the crowds were far less than we used to have. Interestingly, the dance floor was made up of old railroad ties. That sounds like a horrible dance floor but they sanded the railroad ties, and it was one of smoothest dance halls you can imagine. I learned to dance there." On the Town also includes images of Times Square (which is still around), Hollywood's famed Villa Capri restaurant (built in 1957 and demolished in 2005), and a shot by Martha Holmes for Life of a fly-in drive-in, where you could pilot your plane onto a small landing field and then see a movie -- hopefully not Airport! Monroe Gallery's research shows that this unique combination was probably in Monmouth County, New Jersey, and some online bloggers suggest that the parts of the drive-in are still visible, though the drive-in closed long ago. Many of the exhibit's photos were taken by men and women who had international reputations for covering wars, riots, tragedies, and political figures and events. But with these shots, these photojournalists, like the human subjects they focused on, clearly let down their hair. "And collectively," Monroe noted of the exhibit, "you can't help but smile." Santa Fe--Monroe Gallery of Photography, 112 Don Gaspar, is pleased to announce “On The Town”, an extensive survey of more than 50 classic photographs depicting the celebrations of life as captured by renowned photographers. The exhibition opens with a reception on Friday, November 27, from 5 to 7 PM. “On The Town" will continue through January 31, 2010. Photographers in the exhibition include Bernie Abramson, Harry Benson, Margaret Bourke-White, Cornell Capa, Robert Capa, Loomis Dean, John Dominis, Alfred Eisenstaedt, Bill Eppridge, Guy Gillet, Alan Grant, Nina Leen, Bob Gomel, Ernst Haas, Martha Holmes, John Loengard, Carl Mydans, Bill Ray, Verner Reed, Mark Shaw, Joe Shere, Steve Schapiro, Leigh Weiner, Ida Wyman and many others. Gallery hours are 10 to 6 Monday through Saturday, 10 to 5 Sunday. Admission is free. For further information, please call: 505.992.0800; E-mail: info@monroegallery.com. However you spend your day, enjoy. LA TIMES REVIEW OF "ROAD TO FREEDOM"
Four years ago when photography curator Julian Cox moved from L.A.'s J. Paul Getty Museum to Atlanta's High Museum of Art, he looked for a project that would connect him to his new community. The answer came quickly: a commemoration of the 40th anniversary of the death of the Rev. Martin Luther King Jr.
"King was a national figure, but he was also a man of Atlanta," says Cox, who set out to organize a landmark exhibition and build the preeminent collection of its kind at an American art museum. The High's tiny trove of 15 prints grew to 325 by 2008, when “Road to Freedom: Photographs of the Civil Rights Movement, 1956-1968” opened in Atlanta. The show subsequently acquired larger significance -- at the Smithsonian Institution's S. Dillon Ripley Center in Washington, D.C., where it became a major attraction for throngs that turned out for President Obama's inauguration. And now "Road to Freedom" has come to Los Angeles, where it is on view at the Skirball Cultural Center. The latest, expanded edition has a section on L.A.'s civil rights history and a companion show comparing Eric Etheridge's recent portraits of the 1961 Mississippi Freedom Riders with vintage mug shots. There are also documentary films and a lineup of public events. Concurrently, the California African American Museum will present a High Museum-organized exhibition on progressive social change. Robert Kirschner, director of the Skirball Museum, said that Cox's exhibition is well suited to an institution devoted to deepening appreciation of Jewish heritage and American democratic ideals. "The civil rights movement was about equality and justice and human dignity and freedom," he says. "The Skirball has understood those to be primary Jewish ideals." Hosting the show offered an opportunity to talk about the Jewish role in the movement, remember events in Los Angeles and team up with the museum in Exposition Park, he says. 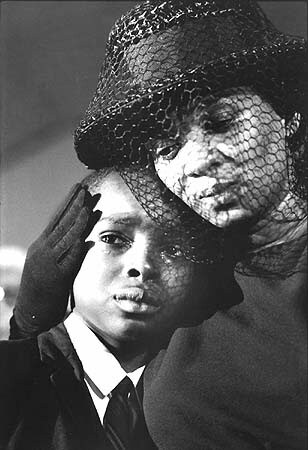 "Road to Freedom" is billed as the largest exhibition of civil rights photographs in more than 20 years. For Cox, a native of Britain, it's much more: an intense American experience that explores the nature of documentary photographs, reveals motivations of the photographers and exposes hearts and souls of people whose lives were profoundly changed by the movement. "Most of the artists who recorded this history photographically are still alive and as passionate today about their involvement in the story as they were then," Cox says. "They were very happy to talk about it and supportive of my ambition to grow the collection. The subjects of the photographs were equally important sources. For me, a relative neophyte in this slice of history, it was a wonderful educational voyage -- very much the kind of research where one person leads you to another." One source was Ben Chaney, the younger brother of James Chaney, who with Andrew Goodman and Michael Schwerner was kidnapped and murdered in 1964 in retaliation for participating in Freedom Summer, a project designed to register voters, perform community service and document racial injustice in Mississippi. In "Chaney Family as They Depart for the Funeral of James Chaney, Philadelphia, Mississippi," a searing photograph by Bill Eppridge, a little boy in a car full of mourners glares at onlookers while his parents and sisters stare straight ahead. "Quite an expression from a 10-year-old," Cox says. "You get a sense of him thinking, 'I know you're watching me. I'm watching you.' 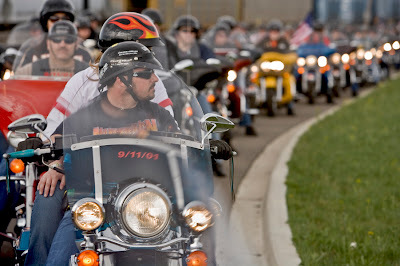 He was full of anger and later got in trouble, but he's back on track and a very strong spokesperson for civil rights." Spanning the years between Rosa Parks' resistance against racial segregation in a Montgomery, Ala., bus in 1956 and King's assassination in 1968, the show focuses on major events, including the march from Selma to Montgomery in 1965. Images of impassioned public speakers, arrests, lock-ups, fires and beatings recall a tumultuous period. But other pictures document peaceful determination and ordinary African Americans getting on with their lives in a fiercely segregated society. Gripping pictures of confrontation all but scream their messages. Other images require explanation: Horace Cort's shot of a white man ostentatiously spraying something over the heads of black sit-in demonstrators at Woolworth's in Atlanta, for example. It's deodorant. 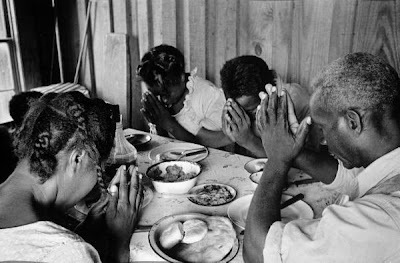 Cox included works by well-known photographers such as Danny Lyon and Bruce Davidson, but he is particularly pleased to have found prints by little-known artists such as anthropologist Doris Derby, who documented Mississippi women doing behind-the-scenes community work. "I wanted to point out the different motivations and strategies of the photographers," Cox says. "Some were self-assigned to the story, others were working for newspapers and major news agencies or civil rights organizations. The movement leaders, people like King and Ralph Abernathy and John Lewis, were very smart about how journalists, photographers and cameramen could help tell their story to the larger world." Lyon, an official photographer for the Student Nonviolent Coordinating Committee, took a considerable risk to shoot pictures of incarcerated young girls that helped to secure their release. In other situations, photographers did their work from front row seats at historic events. Life magazine sent Eppridge and reporter Mike Murphy to Mississippi after the disappearance of Chaney and his colleagues. Prevented from going to the site where the bodies were found, Eppridge rented a plane and took aerial photographs. He also got permission from the Chaney family to photograph their son's funeral and burial. Rich as "Road to Freedom" is as a photographic record, it's far from the last word on the subject. "Many of the photographers are holding onto their archives," Cox says. "Even though they have released certain pictures into our collection and the exhibition, there are still big slices of the story that are privately held and yet to be uncovered." As Walter Iooss and Neil Leifer will tell you, sports photographers have good games and bad games. Like athletes, they get better through intense competition. Having one another as competitors, these two have risen to the top of their game. For that, they are being honored with a joint exhibit, called “Sport: Iooss and Leifer,” at the Annenberg Space for Photography in Los Angeles. The show opened Saturday, but the collaboration behind it goes back almost 50 years. Iooss and Leifer really tell it best. It started at a New York Titans football game at the Polo Grounds that a 16-year-old Walter Iooss (pronounced “Yose”) was watching with his father and a 17-year-old Neil Leifer was photographing on the field for Sports Illustrated. Impressed with the young Leifer’s access, Walter Iooss Sr. went down to arrange a meeting and a portfolio review on behalf of his son. As a result of that meeting, Iooss started shooting for Sports Illustrated as well. The competition began. The rivalry lasted through the ’60s and ’70s, when the two friends battled each other — and every other shooter — for the coveted S.I. cover and also the inside space. After all, they both had families to feed. If it were a boxing match, it would be difficult to call. 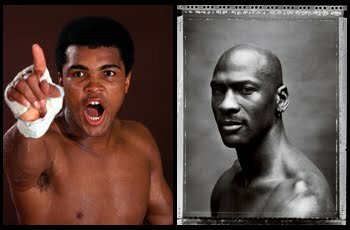 Each is regarded as one of the great sports photographers. Each has taken iconic pictures of the world’s best athletes, on and off the field. And each documented, with unprecedented access, a captivating figure of sports history: Leifer followed Muhammad Ali and Iooss, Michael Jordan. “So at least we each got one,” Iooss said. Iooss and Leifer were given access to these athletes because of their previous success and proven abilities, but their own careers and renown rose with that of their subjects. And here’s the dirty secret: it was easy. Jordan was an equally photogenic subject for Iooss. “It was like traveling with a Biblical character with Michael because everyone in the world, at his peak, wanted to be with Michael and meet him in shake his hand,” Iooss said. “And he had everything, you know, for a photographer. It was like photographing a male model. I always compared him to Elle MacPherson” (whom Iooss has also photographed for the S.I. swimsuit issue). If you didn’t know their names before, you would certainly recognize the work of Leifer and Iooss through their images of these two athletes. Maybe you have an inkjet printout on your wall of Ali gloating vertically over the more horizontal Sonny Liston, or perhaps an actual print — if you could justify spending more than $10,000 for it. On your coffee table, you might have a copy of “Rare Air,” the comprehensive book Iooss put together from his time on the court, on the road and at home with Michael Jordan. Or maybe you own a television set and have turned it on in the last 40 years. Wherever you have seen their work, you haven’t seen it as immersively as you will at the Annenberg Space for Photography. This is the third exhibit for the new museum and will consist of 80 prints (40 from each photographer) in addition to 1,000 digital images that will be shown, with commentary from the photographers, on nine-foot-tall screens. The Annenberg Foundation, parent organization of the museum, wanted to curate an exhibit of sports photography that would stimulate conversation about society’s collective fascination with sport. The foundation chose Iooss and Leifer not only for their iconic photos, but also because they epitomized sport through their photography. “We recognized that the two of them were really fierce competitors,” said Leonard Aube, executive director of the foundation. But the two competitors left the field a long time ago. Leifer left S.I. for a staff position at Time magazine in 1978 and shot over 40 cover stories there. He left Time in 1990 to pursue a career in filmmaking — his current full-time occupation. He will be discussing his most recent film, “Dark Light: The Art of Blind Photographers,” at the Annenberg Space in early February. Iooss is still a sports photographer but has, since the early ’90s, moved away from action to portraiture — his streak of shooting all 43 Super Bowls notwithstanding. He currently divides his time between Sports Illustrated, Golf Digest (where his son, Christian, is the director of photography and his immediate supervisor), and playing golf — his latest athletic love affair. The two haven’t vied for the same cover or double truck since the late ’70s. The competition is over and, today, only the friendship remains. 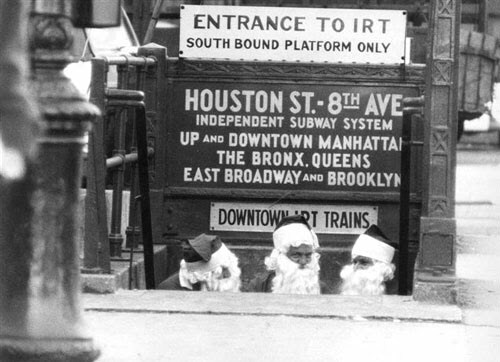 Please join us at Monroe Gallery of Photography for a Special Holiday Book signing by Neil Leifer. Leifer will be signing copies of his latest book, "Guts and Glory: The Golden Age of American Football”. There is a special exhibition with a reception for the photographer on Friday, December 4, 5 - 7 PM, and Neil Leifer will sign books that evening and again on Saturday, December 5 from 1 to 3. "Guts and Glory" contains the best of sports photographer Neil Leifer's 10,000 rolls of football pictures, including hundreds of previously unpublished images. It is a glorious oversize-volume format that weighs 7 pounds, with red-and-white silk cloth overboards and is a limited edition of 1500 numbered and signed copies. We wanted to remind everyone this is the final week to view the impressive Stephen Wilkes' Retrospective, which includes several new photographs. Here is the original announcement post. Watch here for details about the new exhibit, "On The Town". 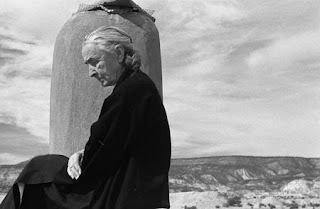 Celebrating Georgia O'Keeffe's 122nd Birthday! The Georgia O'Keeffe Museum will celebrate the 122nd birthday of its namesake artist with a special promotion for visitors on Sunday, Nov. 15, 2009, from 10 - 5. Visitors to the museum on that day will receive a free "Hitching a Ride" poster with paid admission, as well as chance to enter a drawing to win a free supporter-level museum membership. More details here. After a visit to the museum, stop by Monroe Gallery of Photography to view John Loengard's photographhs of O'Keeffe. The Annenberg Foundation is pleased to announce the third exhibit in the Annenberg Space for Photography, an innovative cultural destination in Los Angeles dedicated to presenting print photography and digital images. Entitled "SPORT: IOOSS & LEIFER," the exhibit will feature the work of Walter Iooss and Neil Leifer, two of the world's most preeminent sports photographers. This is the first time both photographers will be featured together in a two-person show. This exhibit is also a rare peek at the artistry of Sports Photography. "SPORT: IOOSS & LEIFER" will open to the public on November 12, 2009 and run through March 7, 2010. Additionally, Monroe Gallery of Photography is excited to welcome Neil Leifer for a very special holiday book signing on December 4 and 5. Leifer will be signing copies of newest book, "Guts and Glory: The Golden Age of American Football". A selection of Leifer's iconic sports photographs will be on exhibit, and there is a public reception with Neil Leifer on Friday, December 4, from 5 - 7. Leifer will also be signing books on Saturday, December 5, from 1 - 3. Please contact Monroe Gallery for further information, or to reserve a copy of Leifer's books. All photographs from Eric Smith's "In America: The War and Patriotism"
Photojournalist Eric Smith has gone in search of Middle America, which he defines as the people living in the nation’s small towns and the less-than-glamorous cities far from the coasts. “Middle America drives our economy, defines popular culture, and fights our wars,” Smith said during a recent phone interview from his home in Auburn Hills, Mich. He insists that without the interest of people who live far from major urban centers, Britney Spears would have been quickly forgotten. Smith isn’t an economist, and he admits that perhaps he’s wrong about the cultural impact of the spending power of small towns. But an Associated Press study has confirmed his belief about their importance to the Iraq war: half of U.S. troops killed in Iraq came from communities with fewer than 25,000 people. And one in five soldiers hails from a town with fewer than 5,000 residents, according to AP. 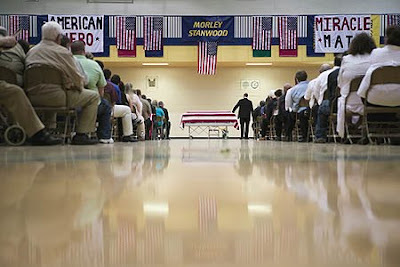 In Michigan’s towns Smith witnessed the funerals of U. S. soldiers killed in Iraq; the Rev. Fred Phelps and his congregation from the Westboro Baptist Church in Topeka, Kan., who picket the funerals of dead soldiers and hold signs with crude messages expressing their belief that U. S. troops die because an avenging God is angry with America’s tolerance of homosexuality; and thousands of men and women who roar into those towns on Harley-Davidson motorcycles to pay respect to their fallen heroes. The clash of beliefs Smith witnessed at those funerals spurred the photo project In America — The War & Patriotism. 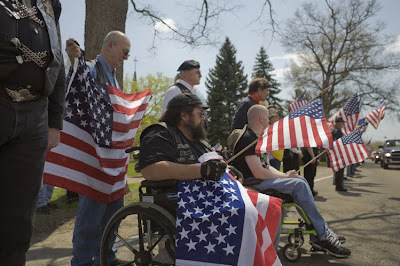 At military funerals, members of the church have greeted mourners with sneers and hateful rhetoric, and that, Smith said, has touched a raw nerve in many Vietnam veterans. 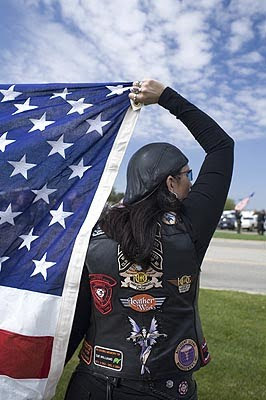 For members of the Patriot Guard Riders, creating a barrier out of flags and their own bodies is cathartic, Smith said. “They do not want these kids treated as they were treated — spit on and harassed. 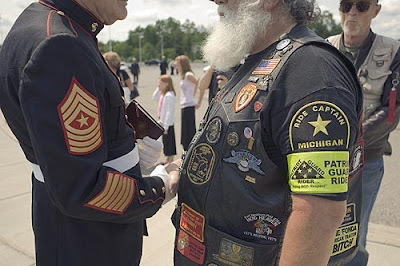 For a lot of these guys, this is a response to the treatment they received more than 30 years ago.” In his photographs, Smith has captured moments when the spit and polish of military honor guards has found common ground with white-haired, bearded, leather-clad bikers. Shelly Liebovitz is a photographer/writer in Los Angeles. 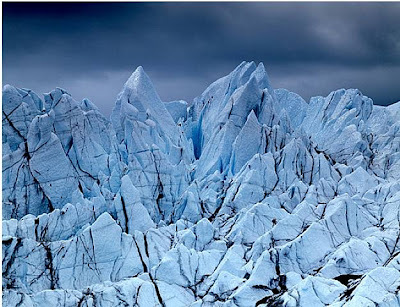 She began writing a blog (www.photoreception.com/blog) concerning "guiding principles" and contemporary photography. Over the last month, she has been interviewing various members of the art community about the presence and role of guiding principles in creating enduring photography, with the intention to publish a book on the subject. Her interview with Monroe Gallery follows. Monroe Gallery is one of over 250 galleries in Santa Fe. Sidney and Michelle Monroe specialize in classic black and white photography. Their gallery includes a significant number of select defining moment photojournalist images. photographer. Sometimes it does, but in the case of Monroe Gallery, the opinions expressed by Sidney Monroe go to the very heart of the photographers with whom he deals. "It is a very interesting topic that you are exploring and it is very germane, particularly in the context of contemporary photography, and it got me to think that I have been very fortunate to know many of the photographers personally that we represent. 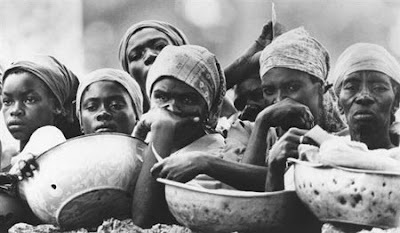 They didn’t articulate it as guiding principles, but it was almost their own personal view on what their job was or what they were doing as a photographer…"
"…[T]he photographers I know were crafters of images. They knew if they could tell a story with their photographs, they would get published in Life or Look magazine, or whatever the vehicle might be… you could say that photographers competed against one another… [but] they were in the driver’s seat. It’s the reverse today… by the nature of luck or skill, certain photographers [then] got shots that got published and those have become the defining images of the events." "…[I]t was just their own decision-making process that got them in the position to get the photograph." 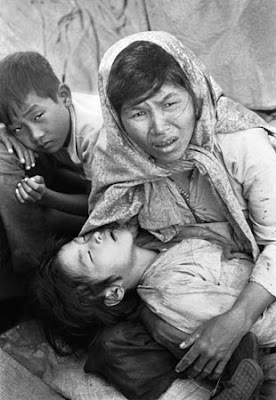 "..the photographers that come to mind, like Bill Eppridge who took the defining moment of Robert Kennedy after he was assassinated, …the Villagers Fleeing a Napalm Strike, that’s Nick Ut, or Eddie Adams, who took the execution picture in Viet Nam—the character of those three men was such that they had the determination to tell the story and get there. 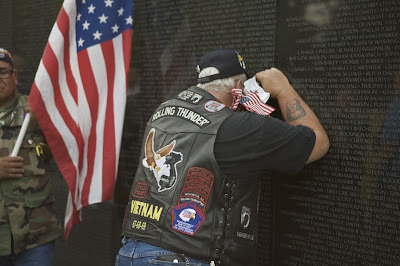 Eddie Adams… became legendary because unlike other photographers [in Viet Nam], he was an ex-Marine. When he would go on assignment he would go up to the commander, identify himself and say that he wanted to go with the first wave of men… So, he put himself out on the front line as opposed to holding back and trying to capture the story after an area had been secured. But, they had these guiding principles… they didn’t necessarily come in with a point-of-view. They surely had their own political views and their own opinions, but they really went in with determination to get to a story and to get a picture." In the field of photography generally, understanding the aesthetics, that is, the set of guiding principles that may be reflected in images, has been a slippery, and sometimes elusive, slope for me. In talking to Sid Monroe, what surfaced was a clarifying point: In trying to capture an image, photographers in the field are faced with so many variables, simply getting the image may be the single-most important driving principle in play. I mentioned writer, Malcolm Gladwell, recently. In another one of his books, Blink, Gladwell suggests that emergency room doctors seemed to arrive at more accurate diagnoses when armed with less patient data than if they have more statistics at hand. It could be that when it comes to blended scenarios where cognitive and intuitive are allowed to flow openly, less is more. That is, our brains may operate at peak when we are more or less flying by the seat of our pants. I wonder then if photojournalists who find themselves in tremendously stressful situations are forced by necessity to function at much higher levels? In a field where preparation is such a critical component to succeeding, the notion of flying at all cuts against the cultural grain. Context is everything. Preparation obviously takes on vastly different meaning in the field, as in battlefield, than in a studio setting. In the past year, I have read a number of times that very accomplished photographers on a well-prepared, lengthy shoots, found that the strongest and most successful images were taken as complete afterthoughts. Or, I should say, the strongest image resulted after the shoot had ended and when the photographer finally felt free to photograph. The repeated sentiment by those professionals speaks loudly to how important our creative instincts are, and, importantly, how they are seemingly relegated to an inferior role in our formal professional processes. In fact, those professionals who took the extra last shot, which succeeded, may have intuitively recognized after their rational minds shut off that something was missing from the day’s work product. We all need to find ways to allow ourselves to fly a little bit more. If you need moral support, review some of the images exhibited at Monroe Gallery. You might, as I did, take a renewed example from those courageous photojournalists, who when confronted with less time, means and opportunity, managed somehow to capture extraordinary images, which ultimately have served to define generations. Additionally, Monroe Gallery of Photography is excited to welcome Neil Leifer for a very special holiday book signing on Decvember 4 and 5. Leifer will be signing copies of his books, "Guts and Glory: The Golden Age of American Football"; "Baseball: Ballet in The Dirt", and "The Best of Leifer". A slection of Leifer's iconic sports photographs will be on exhibit, and there is a public reception with Neil Leifer on Friday, December 4, from 5 - 7. Please contact Monroe Gallery for further information, or to reserve a copy of Leifer's books. 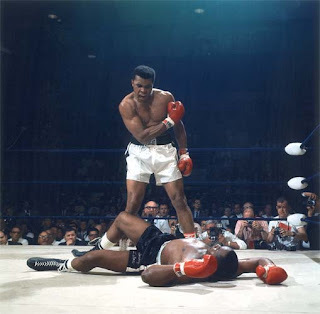 Spanning the careers of both men, over 80 photographic prints will be seen in the Annenberg exhibit which includes iconic images such as Muhammed Ali's victory over Sonny Liston and Michael Jordan in full glory. "SPORT: IOOSS & LEIFER" will take visitors on a journey through some of the most memorable and inspiring moments in sports history. These images will shine a light on the tremendous power, grace and strength it takes to be a top athlete, as well as present the biggest personalities from the field. A digital feature presentation will expand the visitor experience by presenting several hundred more of their photographs and will include interviews and commentary from athletes and artists. Among the concepts explored in the exhibit will be the athlete as a hero and role model in our society, as well as how sports are used to improve the public well-being. During the four-month exhibit, the free IRIS Nights lecture series will continue to be held inside the space on Thursday evenings. Expected speakers include Iooss, Leifer, notable athletes, sports commentators and others. Additional programs related to the exhibit will include a children's photography contest, a themed group slideshow evening, photography workshops and a family event to be held the Saturday prior to Super Bowl Sunday, 2010. Details and final schedules will be announced later this Fall. Neil Leifer's photography career has spanned almost 50 years. 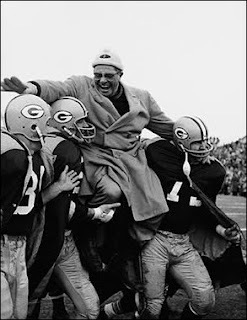 Specializing in sports photography, Leifer's photos have regularly appeared in every major national magazine, including the Saturday Evening Post, Look, LIFE, Newsweek, People and, most often, Sports Illustrated. Leifer's pictures have graced over 200 covers of Time Inc. publications -- 170 at Sports Illustrated, and 40 at TIME Magazine. Out of his 15 published books, his 1978 Abrams book, Sports, has been hailed by many as the best of its kind. His newest book Guts and Glory: The Golden Age of American Football 1958-1978 was published by Taschen in November 2008. Leifer admits his favorite subject to shoot was Muhammad Ali, whom he has photographed on more than 80 separate occasions. Leifer now devotes 100% of his time to producing and directing films.